LEAWOOD — Reflections on the daily Mass readings, special Advent prayers, the Liturgy of the Hours, novenas, Marian devotions — the list of Catholic prayers and tools to deepen one’s spiritual life is as long as it is rich. But with so many spiritual resources, how does one begin to find and access them? Abby Upah of St. Michael the Archangel Parish in Leawood had the same question. And in 2016, she and a group of individuals from the Kansas City area decided to do something about it. They created what many are calling the Catholic version of Google and what they call Faith Walk. 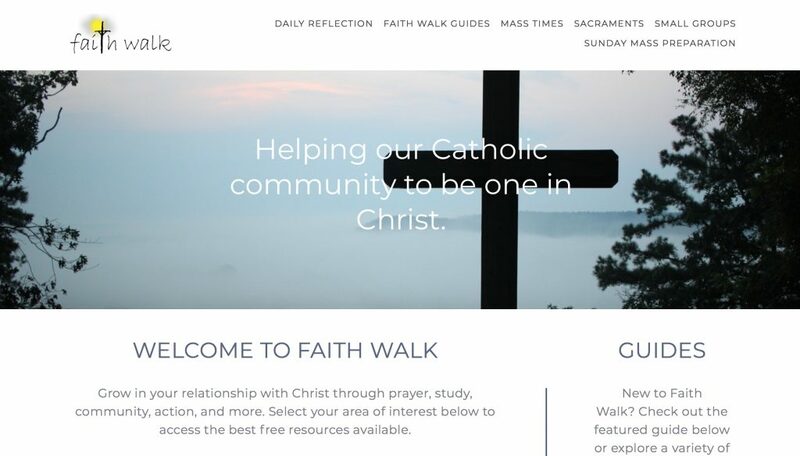 Faith Walk is a Catholic website that makes more accessible the church’s copious spiritual resources by centralizing hundreds of prayers, podcasts, reflections and more — and it’s completely free. Born of the desire of many Christ Renews His Parish (CRHP) alumni, some of whom were involved in the Ignatian Spirituality Center of Kansas City, Missouri, Faith Walk began as a simple website offering mostly Ignatian spirituality resources. “There are so many resources out there,,” said Upah. “But if you don’t really know what you’re looking for, [they] are really hard to find. Quickly, the demand for more Faith Walk resources began to grow. Upah and her team began emailing people they knew, asking what faith-based online resources they frequently used that could be drawn upon for the site. Today, Faith Walk includes content from nearly 150 websites, each of which is reviewed by the Faith Walk board before being uploaded. Faith Walk also boasts an Apple- and Android-supported smartphone app — and its daily emails reach over 500 subscribers. In addition to being one of the founding members of Faith Walk, Upah programmed and maintains the website and serves as a board member of the nonprofit Second Wind. “Second Wind exists basically to help with Faith Walk . . . and the regional support team for CRHP,” explained Upah. Two years ago, Sacred Heart, Shawnee, parishioner David Saville started meeting once a week with a group of men who had completed CRHP. During their lunch hour, the men wanted to continue deepening their faith in the context of fraternal community. “We went through a few weeks of using [Faith Walk] to help facilitate the lunches and ended up settling on it as a resource that we would use every week,” said Saville. Saville added that the group continues to use Faith Walk for a small group agenda most frequently. The resource includes the upcoming Sunday Mass readings, questions based on the readings and reflections that help guide conversation. The father of four boys, Saville said Faith Walk particularly has helped him participate in the Mass while his wife directs the music at Our Lady of Unity Parish in Kansas City, Kansas. Monsignor Tom Tank of Church of the Ascension in Overland Park also has found Faith Walk to be a fruitful resource in his personal and pastoral life. “I have found [the resources on liturgy, Scripture and spirituality] very helpful in developing my own prayer life, as well as preparing for homilies and other presentations,” he said. He appreciates that Faith Walk consolidates information, rather than creating its own content. “There’s something for everyone,” said Upah. From high school students’ small groups to parishioners well into their 80s, Upah has witnessed people from many eras and stages of life utilizing Faith Walk. “As each of my boys progresses through their faith life,” said Saville, “[Faith Walk] also has resources in there for confirmation and reconciliation. For Upah, working behind the scenes on Faith Walk has been a blessing and a challenge. “It’s been an accountability thing for me because I have to practice what I’m preaching,” she said. “It’s brought a lot of community to my life,” Upah concluded. “We’re in unity here, trying to learn and find resources to grow. To visit the Faith Walk website, click here. BUT no web address was given. Please reply how I can access this site. Googled in my search for Faith Walk…..to no avail. Can you assist with the URL? Here is the URL! https://www.myfaithwalk.org. Thank you for your interest, Stephanie!